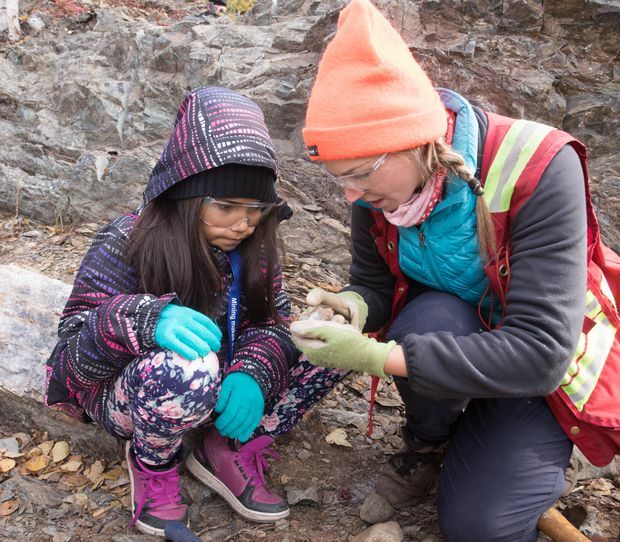 A young student is shown how to look for quartz during a Mining Matters field trip to the Ranney Hill Geological Interpretive Trail near Yellowknife. Mining Matters is a charitable organization that helps elementary and high-school students learn what mining is and what careers are out there. As it gears up to hire 100,000 new workers by 2029, Canada’s mining industry grapples with dated public perceptions, a reputation for boom-and-bust cycles and low participation of women. “There is a sense of urgency, but also optimism,” says Ryan Montpellier, executive director of the Mining Industry Human Resources Council (MIHRC), of the race to recruit a new generation of engineers, geologists, environmental scientists and other specialists. Emerging from its latest downturn, the mining sector is introducing new work placements, scholarships and hands-on learning opportunities for postsecondary students, often partnering with postsecondary institutions and non-profit organizations. Among new initiatives, his council last year introduced Gearing Up, a federally funded consortium of employers, industry associations and postsecondary institutions with mining programs that offers paid co-op placements, internships and support for student case competitions. Employers receive a wage subsidy of up to $7,000 and provide work experience for postsecondary students. So far, the program has generated 250 net new “work-integrated” learning placements, according to MIHRC. Individual companies are adding their own initiatives. Teck Resources Ltd., a diversified metals and mining company, reports women made up 17 per cent of its 10,000-person work force in 2017, up 31 per cent from 2014, and just above the industry average of 16 per cent. Across its operations, the company has introduced digital marketing and advertising campaigns to recruit female and Indigenous employees and added training programs to address gender and unconscious bias, according to a company spokesman, who notes that women accounted for one in three new hires in 2017. At its mine sites, Teck has enhanced locker-room facilities for women and now provides personal protective equipment in gender-appropriate sizes. Teck joins a growing list of companies adding policies and practices to attract a diverse work force. Samantha Espley, who began her mining career in 1988, has worked in various capacities in the industry, including above and below-ground assignments at sites in several provinces. 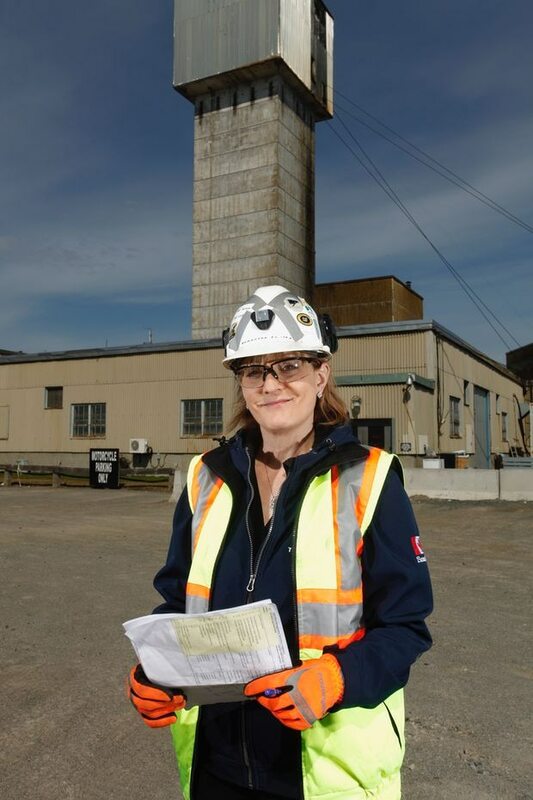 She joined Vale in 1990 and stands in front of the company’s Copper Cliff North Mine Headframe in Sudbury. Among them is Brazil-owned Vale, where long-time employee Samantha Espley, director of mining, technology and innovation for Ontario operations, began her mining career in 1988 working for companies with few women or gender accommodations. “You had policies, even job titles, aimed at men,” says Ms. Espley, president-elect of the Canadian Institute of Mining, Metallurgy and Petroleum. For spotting top talent, some companies have teamed up with colleges and universities, many of them with research and curriculums focused on an increasingly automated industry. At the University of British Columbia’s Norman B. Keevil Institute of Mining Engineering, “a major piece of our curriculum is aimed at new technologies and methods in industry,” program manager Malcolm MacLachlan said, with researchers applying artificial intelligence and other tools to improve mine performance. Companies are responding with financial assistance. Last fall, Sudbury-based Hard-Line, a supplier of remote-control technology and other automation-related services, pledged $250,000 over five years to Laurentian University’s Bharti School of Engineering in Sudbury, Ont., for its mechatronics program. The gift covers lab renovations for enhanced student learning, curriculum development and field trips to Hard-Line facilities. In January, the Bharti school also received $250,000 for student scholarships from Hatch, an engineering design-build firm. But mining’s reputation as dirty, dangerous and cyclical remains a barrier. His counterpart at Laurentian’s Harquail School of Earth Sciences, Douglas Tinkham, says “we really need to make students aware of what a profession could look like.” For example, his school works with local Indigenous communities to introduce elementary and high-school students to diverse careers in mining. “We show the students various aspects of geoscience because geology is not all about going out and collecting rocks,” he says. Moreover, he says the industry’s need for international travel should be attractive to millennials. Of ongoing concern, though, is a lag in mining enrolment compared with other engineering programs. Accredited engineering programs’ enrolment more than doubled between 1996 and 2016 compared with minimal growth in specialties of mineral, materials, metallurgical and geological engineering, according to MIHRC, noting a 12-per-cent drop in undergraduate mining engineering enrolment between 2015 and 2016. At Queen’s University’s Robert M. Buchan Department of Mining, currently revamping its curriculum to incorporate data analytics and machine learning, the graduating cohort of mining engineers peaked at 74 in 2016. Last year, after a first-year general engineering program required for all students, 24 of them went into mining in the second year. For its own outreach, his department has added programs for those already in mining or looking to join the industry. A part-time bachelor of mining engineering technology, introduced in 2016 for college-educated workers in mining to upgrade their skills, currently enrols 28 students. This spring the department rolls out an enrolment campaign for a new online undergraduate certificate in mining technologies, for those with a degree outside mining or at least two years of university training. “The certificate lets you get exposure to mining through taking six online courses,” says Dr. Daneshmend, with the emphasis on preparing students from diverse academic backgrounds for a mining career. The task ahead is not lost on Mr. Montpellier, of MIHRC. 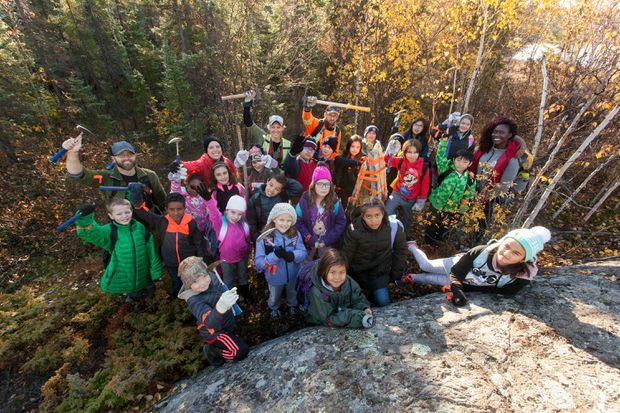 A grade 4/5 class from Range Lake North School in Yellowknife learn about rocks and minerals at the Ranney Hill Geological Interpretive Trail. Mining Matters offers educational resources that meet provincial curriculum expectations, created by educators and Earth science experts. Outreach efforts to introduce students to mining are on the rise. 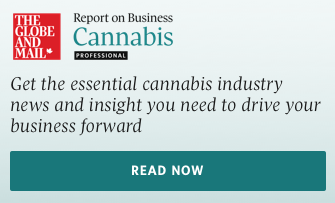 Among them are two long-established programs that report success in reaching their target audience. The Prospectors and Developers Association of Canada introduced the Student-Industry Mineral Exploration Workshop in 2007 to augment skills of postsecondary geoscience students headed for careers in mineral exploration and mining. Every year, 26 top geoscience students attend a two-week workshop that includes field trips, mine tours and mapping exercises – and discussions of health and safety, sustainability and the financial aspects of mineral exploration. To date, more than 300 students have participated in the program. By contrast, Mining Matters is a charitable organization that provides K-12 curriculum material and teacher training for students to learn about geology and mineral resources. The 25-year-old organization, funded by industry and governments, has worked with more than 700,000 teachers, students and the public. Last year, the organization reached more than 30,000 students, including several Indigenous-focused summer camps, says executive director Laura Clinton. “There is a need for resources and training so that teachers are equipped to teach the curriculum with confidence,” she says. Curriculum kits include rock and mineral samples, posters, videos and hands-on learning activities for students.